March 21th, 2012, e-con Systems Inc., a leading embedded design services company specializing in development of advanced camera solutions announces the world’s first Stereo Vision camera reference design based on Texas Instruments’ OMAP/DM37x family of processors and Gumstix® Overo® computer-on-module (COM) series. 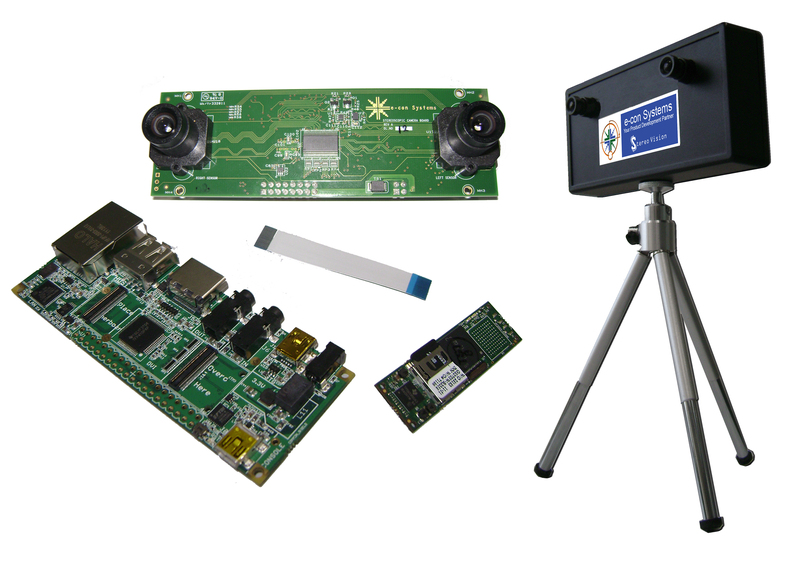 The Stereo Camera Reference design, code-named Capella, includes a DM3730-based Gumstix® Overo® WaterStorm COM, a Gumstix® Tobi expansion board and e-con’s camera daughter board e-CAM_9V024_STEREO. The Capella reference design comes with a Software Development Kit with full source code for application development on top of V4L2 or OpenCV, enabling customers to develop their own Stereo Vision Camera based applications. e-con Systems also provides sample applications with source, for applications such as synchronous stereo image capture, depth measurement etc. 3D analytical applications such as machine vision, mobile robotics (obstacle detection) and automotive applications including computer aided navigation and driver guidance. 3D object reconstruction applications such as reconstructing 3D details of sculptures, monuments, human faces etc. 2D synchronous dual-camera applications where, two simultaneously captured images of same (or different) objects are required. “Being one of the leading suppliers of embedded camera solutions, we have many requests from customers who want to integrate pixel synchronous stereo vision into their products. These customers have a variety of application requirements other than showing the traditional disparity map and many of them use Gumstix® Overo® COMs as their processing system. With the Capella reference design, e-con Systems precisely addresses these requirements and also allows customers to implement traditional stereo camera applications such as disparity mapping, human tracking and gesture detection by implementing their own algorithms on top of our Stereo Camera reference design,” said Mr.Ashok Babu, President, e-con Systems. “The Stereo Camera reference design can also be customized to interface with other TI OMAP35x/DM37x implementations. Baseline, lens can also be customized to suit customer’s specific requirements,” added Mr.Ashok Babu. Capella runs Linux 2.6.35 and has Ethernet, HDMI Video port, USB OTG port, and a serial interface for Linux console. The Stereo Camera Engine driver is V4L2 compatible and is available with an OpenCV interface patch allowing customers to develop applications based on plain V4L2 API or the OpenCV stack. The Stereo Engine driver exposes three V4L2 interfaces to the application developers to capture the left, right and combined left+right video streams. The SDK contains sample applications using both the V4L2 interface and also OpenCV stack. The e-CAM_9V024_STEREO is powered by a pair of 1/3” Global Shutter Monochrome Aptina CMOS image sensor MT9V024, with an active area of WVGA 752(H) x 480(V) (360690 pixels) and capability of delivering Synchronous Parallel 736(H)x480(V) Monochrome video of 8-bpp gray scale images at 30fps.The cameras come with pre-aligned and pre-calibrated M12 lenses on an S-mount lens holder and customers can select and calibrate the lens for specific requirements. The two cameras are separated by a distance of 100mm (the baseline). This baseline allows accurate measurement to a depth of three meters. Customers interested in increasing the baseline or changing the lenses can approach e-con Systems’ for customization. To evaluate the Capella reference design, please contact sales(at)e-consystems(dot)com. For more information, please visit the Capella product page and video demo. e-con Systems will demonstrate Capella at the ESC Tradeshow, San Jose (March 26 – 29th, 2012) - Board Zone, Booth No:#1624.
e-CAM is e-con Systems’ reference design featuring a camera board with a camera module interfaced to a processor on its high speed CMOS interface. e-con Systems also provides sample drivers for WinCE, Linux and Android. For processors that don’t have the Camera ISP pipeline, e-con Systems provides the complete software stack for raw image sensors. In addition to ‘off-the-shelf’ solutions, e-con Systems also offers individually crafted custom designs for customers interested in camera modules. e-con Systems is an embedded product development services company focused on concept to product solutions with a strong technology leadership in camera solutions. e-con Systems has expertise in mobile application processors including PXA320, Freescale i.MX53x, TI OMAP35x, TI AM/DM37x and Digital Media Processors DM355/DM365 and has been using its product engineering services to help customers develop products based mainly on camera-like Stereo vision systems, video surveillance equipment, IP cameras, Low vision aid equipment and document visualizers.